David Cohn, who founded http://spot.us -- essentially a "citizen journalism" site with a model based on bringing together freelancers, publishing venues and the public. In short: the public can support stories they feel are important, freelance journalists can get a little extra financial support to develop and research stories, and editors can get stories they can't support with their own publication / site resources. Robert Rosenthal, a Pulitzer Prize finalist and journalism professor who is interested in the transition from traditional journalism to new models. He's connected to http://centerforinvestigativereporting.org but obviously well-versed in the existing models. A.C. Thompson, who has worked with various San Francisco publications but is now associated with http://propublica.org and has received a Polk Award. Lola Vollen, a physician who has shifted her work toward social justice and human rights, working with http://exonerated.org. And, central to the panel: famed documentary photographer Susan Meiselas. If you don't know her work, look it up, and spend some time with it. http://susanmeiselas.com/. The important thing, for my discussion here, is to consider how Meiselas' model of going to a place, getting deeply invested in a story, and allowing a point of view to develop is purely documentary photography rather than photojournalism. Now, read that clearly: it isn't a critique, but praise. As well, it's an important distinction between the two fields. So there was discussion noting that old support structures like "full time work" and "expense accounts" and "go to Central America for eight weeks, here's your ticket" were clearly gone, and that the new replacements are still developing -- and quite different in nature. Think of a blend between crowdfunding and NPR and you'll have part of the picture. Add YouTube, Digg and Twitter and you'll get a hint of the rest. But just a hint. To my mind, this missed an important point. Beyond the financial issues, the development of the Internet is important not just as a killer of the printed daily newspaper, but as a killer of one aspect of photojournalism. That is, imagine an event happens. It's quite likely that a half-dozen civilians with cellphone cameras are there long before your contract photojournalist gets an alert email, and it's no surprise if there's a shaky video clip from a passerby on CNN immediately. Spot news? It's covered by a cell phone cam. I'm not negating the value of a PJ here -- I just think the game has changed and that the role of the photojournalist has shifted toward documentary work. By this I mean that if there's a glut of "just okay shots" out there, and we can hand a DSLR to the reporter and have them come back with acceptable stills and video, then the role of photojournalist becomes about quality. The role of the photojournalist becomes more like the role of the documentary photographer. Speed becomes less critical -- you've already been beat to the punch. But that leaves a ton of room for quality, depth, beauty, humor, accuracy -- all the elements the practice of documentary allows. I want to see that first glance picture, yes, and I don't care that it's a sloppy picture without context. But I'm going to get much more out of a smart, deep, significant presentation later -- something only the best photojournalists can do. 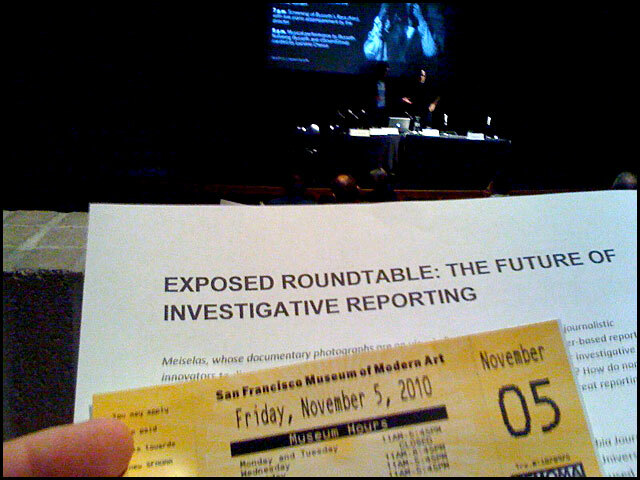 So, for me, the question I see is not "how does investigative reporting survive?" but "how does an unknown Susan Meiselas find a way to do the work today?" Ted - Just a couple of thoughts on what you've written here - I disagree with the perspective that those with cellphones who are witnessing an event are 'covering' it well enough to make images that communicate the essence of that event clearly for an audience. Certainly, we cannot deny that the impulse to photograph events has been answered by the cultural ubiquity of the cell phone camera, but watching (or photographing) an event as it unfolds is only one aspect of the story. The common cell phone user does not necessarily have the access to tell the story more fully or with greater depth, and they are not thinking about story telling when taking their images...just about documenting. And there's a big difference. Well, just to clarify. When I said it was "covered" I didn't mean to equate that with "covered as well as a good photojournalist would." As you've noted, it would not be at that level. What I was hoping to get it was that even the PJs sitting by a scanner are now beat out of the first image -- there's already someone there. So more than ever, there's a shift to the quality a good PJ or VJ or documentary photographer can bring to the situation. From an economic perspective, also, my agreement with you that a cellphone pic isn't good enough ends up being moot -- so often now news sites and even many major agencies are grabbing images from online sources and then no longer are willing to pay for a better image, feeling they have it covered. I was very disappointed last year when a usually-reputable site grabbed a clearly-photoshopped image of President Obama seemingly laughing at David Beckham's loss. It made it obvious that the night editor had grabbed, uncredited, the picture from the web and brought it right into the "authenticated" news. With disastrous results. I emailed the site, and they were very very very inhospitable about it. They removed the image, but would not answer my question: were they grabbing unauthenticated images regularly? In other words: I agree with you from the point of view that a PJs shot would be better. But I think it is easy to find a lot of cases were a person on the corner with a cellphone cam posts to Flickr before a serious shooter gets out the door with their camera bag -- and editors are using these. It's not what I'd prefer, but it seems to really be the direction things are moving.